If you have been following my blog, you know that I looooove Hawaiian food. Most of the recipes require only a few humble ingredients that results in ultra flavorful food that brings you back to the beautiful Hawaiian islands. 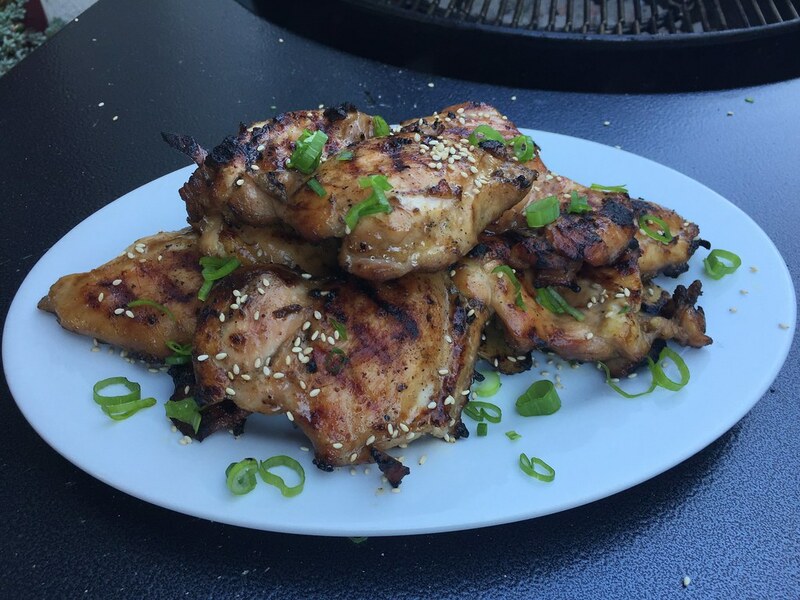 Hawaiian teriyaki chicken is no different. Marinaded in mainly Aloha Soy Sauce and Sugar, you can prep within 5 minutes. Then you let time do its thing to let the meat soak up all the flavors from the marinade. Finally, you can quickly grill for a quick meal. Marinading takes the longest, so I recommend doing it before you go to bed or right when you wake up. It takes 5 minutes. At restaurants, Hawaiian teriyaki chicken is typically cooked (grilled) on a flat top. 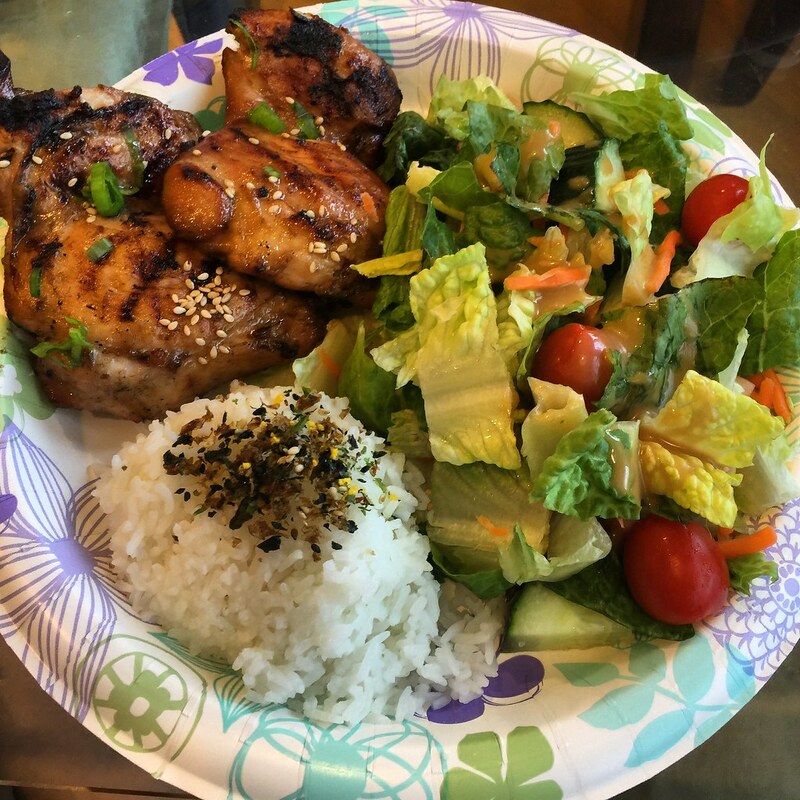 However, during a recent trip to Oahu, I went to a place near Kailua Beach called The Hibachi and watched the cook grill their teriyaki chicken (and other meats) on their grill outside of their little market. The caramelized crust formed during grilling adds an extra layer of yumminess to the chicken. Like other grilled and bbq’ed meat, I really enjoy eating this chicken with just a side of white rice and salad. However, sandwiching the chicken between toasted buns is super scrumptious as well. Create Marinade – In a medium bowl, combine Aloha soy sauce, water, sugar, black pepper, and rice wine vinegar. Mix ingredients until sugar is dissolved. Add garlic and ginger. Mix again. Marinade Chicken – In a medium bowl or ziplock bag, add chicken thighs. Pour marinade over chicken and mix well. Marinate for at least 3 hour, preferably overnight. Grill Chicken – Prepare grill for medium high heat. Season grill grate with vegetable oil. 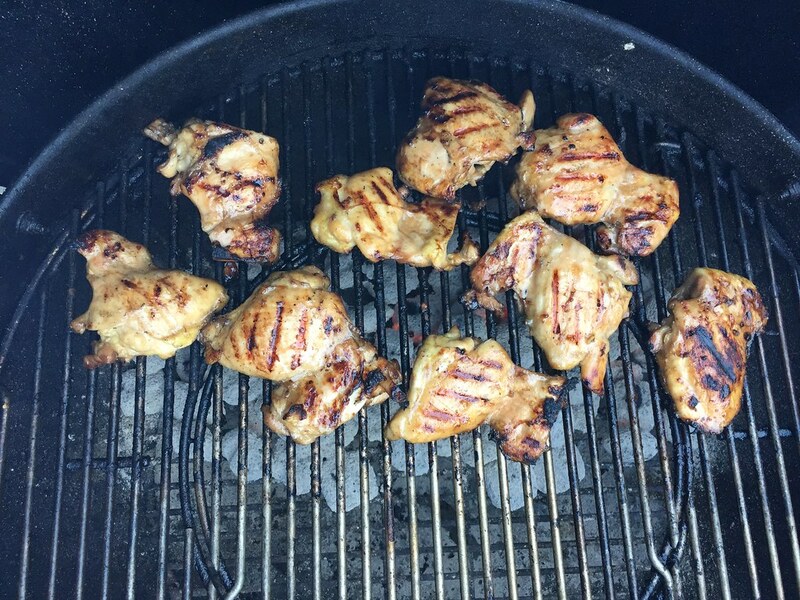 Grill chicken thighs over direct heat for about 5 minutes per side or until cooked through. Plate Chicken – Place cooked chicken thighs on a plate. Garnish with toasted sesame seeds and chopped green onions. You can use this marinade for bone-in chicken. However, follow indirect cooking method if using bone-in chicken. If flare up occurs while cooking chicken, simply close the lid for a few seconds to tame the fire.